What Are Risks and Side Effects of Rheumatoid Arthritis? What Are Rheumatoid Arthritis Treatments and Medications? Rheumatoid arthritis is a chronic disease causing inflammation, swelling, and pain of joints, such as the small joints of the hands, elbows, shoulders, wrists, fingers, knees, feet, or ankles. 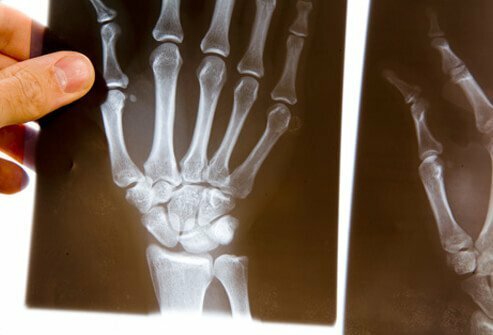 The symptoms of rheumatoid arthritis typically occur in a symmetric pattern, meaning that both sides of the body are affected at the same time. Other common symptoms include fatigue, malaise (an overall feeling of being unwell), and morning stiffness. Rheumatoid arthritis is frequently abbreviated as RA. Rheumatoid arthritis causes joint damage, leads to considerable disability, and shortens life span. The disability may be so severe that individuals cannot work and movement and independent living are very limited. Life span is shortened in people whose conditions do not respond well to treatment. The risk of early death is increased by complications such as infections, cardiovascular (heart and blood vessel) disease, or gastrointestinal bleeding. These complications may be due to rheumatoid arthritis or to side effects from the medications used to treat it. Knowing as much as possible about rheumatoid arthritis helps people learn to cope with the problems it causes. Exercise can help to improve and sustain range of motion, increase muscle strength, and reduce pain. Using joints and tendons efficiently can reduce stress and tension on the joints. Drug therapy for rheumatoid arthritis has improved so much that it can now stop disease progression, preventing joint damage and loss of function. The earlier that treatment is started, the better the chance to slow disease progression and prevent damage and loss of function. People who are severely disabled by rheumatoid arthritis may require orthopedic surgery for joint reconstruction or replacement with manufactured joints (prostheses). Pain relievers may be used occasionally. Such drugs include acetaminophen (Tylenol), tramadol (Ultram), or narcotic-containing pain relievers. These drugs do not reduce joint swelling, deformity, or damage. The precise cause of rheumatoid arthritis is unknown. Although infection has been considered likely, no bacterial or viral organism has been proven responsible. Rheumatoid arthritis is also associated with a number of autoimmune reactions (immune responses misdirected at one's own body, instead of at an outside organism), but whether the autoimmune reactions cause rheumatoid arthritis, or rheumatoid arthritis causes the autoimmune reactions, is not known. A significant genetic (hereditary) factor exists in most patients with rheumatoid arthritis. Periodontitis, smoking, and the bacteria in the bowel (microbiome) have all been associated with causing rheumatoid arthritis. Drugs in this class include aspirin (Anacin, Ascriptin, Bayer Aspirin, Ecotrin) and salsalate (golimumab). How salicylates work: These drugs decrease the production of prostaglandins. Prostaglandins are substances found in many tissues. They cause pain and inflammation. The use of salicylates for rheumatoid arthritis has been largely replaced by nonsteroidal anti-inflammatory drugs. Use: Salicylates are given as oral tablets or capsules in various dosage regimens. Take them with food to decrease stomach irritation. Drug or food interactions: Individuals taking anticoagulants, such as warfarin (Coumadin), should not take certain salicylates (aspirin). The large doses used for RA may increase effects of oral diabetic drugs, thereby lowering blood sugar levels. Use with corticosteroids, such as prednisone (Deltasone, Orasone) or nonsteroidal anti-inflammatory drugs (NSAIDs) may increase the risk of developing gastric ulcers or gastrointestinal bleeding. Additional interactions are possible, which makes it essential to consult with a doctor or pharmacist before taking prescription or over-the-counter drugs. Drugs in this class include diclofenac (Cataflam, Voltaren), ibuprofen (Advil, Motrin), ketoprofen (Orudis), naproxen (Aleve, Naprosyn), piroxicam (Feldene), etodolac (Lodine), indomethacin, oxaprozin (Daypro), nabumetone (Relafen), and meloxicam (Mobic). How NSAIDs work: NSAIDs prevent the body from producing prostaglandins, which have been identified as a cause of pain and inflammation. They do this by inhibiting the COX (cyclo-oxygenase) enzymes that are important in the formation of prostaglandins by cells. Several types of anti-inflammatory agents exist. Doctors recommend NSAIDs as the first type of medicine to try after the initial diagnosis of rheumatoid arthritis is made. Some of these drugs may be purchased without a prescription. Use: NSAIDs are taken as oral tablets, capsules, or liquid suspension in various dosage regimens. Take them with food to decrease stomach irritation. Drug or food interactions: Individuals taking anticoagulants (for example, warfarin [Coumadin]) should be monitored for increased bleeding. NSAIDs may cause fluid retention, thereby decreasing the effectiveness of high blood pressure medications and diuretics (water pills). Phenytoin (Dilantin) or methotrexate (Rheumatrex) toxicity may increase when NSAIDs are used. Use with corticosteroids (for example, prednisone [Deltasone, Orasone]) or high doses of aspirin may increase the risk of developing peptic ulcers or gastrointestinal bleeding. Some NSAIDs interfere with aspirin when taken to prevent heart disease. Celecoxib (Celebrex) is included in this drug class. How COX-2 inhibitors work: These drugs are a new type of NSAID. By inhibiting mainly the COX-2 enzyme, they decrease prostaglandins at the site of inflammation (for example in the joints), but they have less effect on prostaglandins in the GI tract. Therefore, these NSAIDs decrease, but do not eliminate, the risk of gastropathy, including stomach erosions, ulcers, and bleeding. They must be obtained with a prescription but are longer-acting than most NSAIDs and have less risk of causing stomach discomfort or ulcers. Who should not use these medications: People with allergy to aspirin or NSAIDs should not take selective COX-2 inhibitors. Those with allergy to sulfa drugs should not take celecoxib (Celebrex). Use: COX-2 inhibitors are administered as oral tablets or capsules in various dosage regimens. Take with food to decrease stomach irritation. Drug or food interactions: Individuals taking anticoagulants (for example, warfarin [Coumadin]) should be monitored for increased bleeding. COX-2 inhibitors may cause fluid retention, thereby decreasing the effectiveness of high blood pressure medications and diuretics (water pills). Drugs in this class include azathioprine (Imuran), cyclosporine (Sandimmune, Neoral), gold salts (Ridaura, Solganal, Aurolate, Myochrysine), hydroxychloroquine (Plaquenil), leflunomide (Arava), methotrexate (Rheumatrex), penicillamine (Cuprimine), and sulfasalazine (Azulfidine). How DMARDs work: This group includes a wide variety of agents that work in many different ways. They all interfere with the immune processes that promote inflammation. Use: Azathioprine is taken orally up to three times daily. If the response is inadequate, the dose may be gradually increased after six to eight weeks. Take with food to decrease stomach irritation. Drug or food interactions: Use of other immunosuppressant drugs increases the risk for infection and increases toxicity to bone marrow or blood cells. Many drug interactions exist. Contact a doctor or pharmacist before beginning new prescription or over-the-counter medications. Side effects: Immunosuppressant drugs are not safe during pregnancy. They may also cause bone marrow or blood cell toxicity. People with impaired kidney or liver function may need lower doses. Use: Cyclosporine is taken orally in daily doses. Take it at the same time of day and with the same food. High-fat meals may decrease absorption, while milk may slightly increase absorption. Drug or food interactions: Patients must tell their doctor what medications they are currently taking, because many drugs interact with cyclosporine. Grapefruit juice may increase the level of cyclosporine in the blood, causing increased side effects. Cyclosporine may increase the risk of severe muscle and kidney toxicity of cholesterol-lowering medications known as statins (lovastatin [Mevacor], atorvastatin [Lipitor], simvastatin [Zocor], Pravastatin [Pravachol]). Side effects: To guard against problems, blood pressure and kidney and liver function are monitored on a regular basis, as is the level of cyclosporine in the blood. Cyclosporine may increase the risk of infection or lymphoma. While primary treatment in the past, other DMARDs are used instead of gold salts as treatments for rheumatoid arthritis because of their effectiveness and lower rates of toxicity. Use: Gold pills are taken every day or every other day. The injectable forms may be taken by injection every one to two weeks for the first five to six months, and then decreased to monthly injections. Drug or food interactions: Gold salts may increase bone marrow toxicity when used with other drugs that depress bone marrow function. When used with penicillamine (Cuprimine), gold salts may increase the risk for skin rash, bone marrow toxicity, and decreased blood cell counts. Who should not use this medication: People with allergy to hydroxychloroquine or related drugs (for example, chloroquine [Aralen]), and those with a history of vision changes caused by the drug or related drugs should not take them. Use: Hydroxychloroquine is taken orally in varying doses. Take with food or milk. Drug or food interactions: Hydroxychloroquine may increase the risk of liver toxicity when administered with other drugs toxic to the liver, such as acetaminophen (Tylenol). Hydroxychloroquine may increase levels of digoxin and metoprolol in the blood. Use: Leflunomide is taken as an oral tablet. Drug or food interactions: Cholestyramine (Questran) reduces the amount of leflunomide in the blood, thereby decreasing effectiveness. This medication is used to more rapidly eliminate leflunomide from the body if serious side effects are experienced. Rifampin (Rifadin, Rimactane) may increase leflunomide's risk of toxicity. Leflunomide may increase the level of warfarin (Coumadin) in the blood and the risk for bleeding. Some vaccinations are not recommended while taking leflunomide. Side effects: Effective birth control is essential while taking leflunomide. This drug may cause birth defects if it is taken by the mother during pregnancy or by the father during the time of conception. Individuals with kidney or liver disease may need lower doses. Leflunomide may cause high blood pressure or worsen preexisting high blood pressure. Common side effects include stomach pain and diarrhea. Use: Methotrexate is taken orally or as an injection once per week. It is the major DMARD to treat RA and the standard to which other treatments are compared. Drug or food interactions: NSAIDs (Motrin, Advil, Aleve, aspirin) may increase toxicity. Folic acid deficiency may worsen side effects of methotrexate. To lessen GI toxicity, daily administration of low dose folic acid (1-2 mg) is recommended. Side effects: To guard against problems, kidney and liver function are monitored on a regular basis, as are blood cell counts. Methotrexate may cause toxic effects on blood, kidneys, liver, lungs, and gastrointestinal and nervous systems. Use: Penicillamine is taken orally at least one hour before or two hours after meals. Penicillamine may take many months before a benefit is seen. It is rarely used to treat RA today. Drug or food interactions: Penicillamine may increase bone marrow toxicity when used with other drugs that depress bone marrow function. When used with gold salts (auranofin [Ridaura], aurothioglucose [Solganal]) or hydroxychloroquine (Plaquenil), penicillamine may increase the risk for skin rash, bone marrow toxicity, and decreased blood cell counts. Vitamins containing iron, sucralfate, or antacids should not be taken within two hours of taking penicillamine, since they decrease its absorption. Use: Sulfasalazine is taken orally in varying doses with food. Drug or food interactions: Sulfasalazine may decrease warfarin (Coumadin) absorption, thereby decreasing warfarin effectiveness. Sulfasalazine may increase the risk of bleeding when administered with other drugs that alter blood coagulation (for example, heparin [Hep-Lock]). Drugs in this class include abatacept (Orencia), etanercept (Enbrel), infliximab (Remicade), golimumab (Simponi), certolizumab pegol (Cimzia), adalimumab (Humira), tocilizumab (Actemra), rituximab (Rituxan), and anakinra (Kineret). How biologic drugs work: These agents inhibit key factors responsible for inflammatory responses in the immune system. Abatacept inhibits T-cell activation. Etanercept, infliximab, golimumab, certolizumab and adalimumab are tumor necrosis factor (TNF) antagonists. Tocilizumab blocks interleukin-6 (IL-6), rituximab inhibits B-cells and anakinra inhibits interleukin-1 (IL-1). Who should not use this medication: People with allergy to abatacept or those with severe infection should not take this medication. Use: Abatacept is given intravenously (IV) as an infusion over 30 minutes. During the first month, it is given every two weeks, then every four weeks thereafter. It may be used alone or with DMARDs. Orencia is also given as a weekly subcutaneous injection. Drug or food interactions: Abatacept should not be administered if TNF antagonists, such as etanercept, infliximab, or adalimumab, are also being given to treat rheumatoid arthritis. Combining these therapies greatly increases the risk for serious infection. Additionally, it should not be given with anakinra since this combination has not been studied adequately. Who should not use this medication: People with allergy to etanercept and those with serious infection or active tuberculosis should not take the drug. Use: Etanercept is taken as an injection once or twice a week. It may be used alone or with concomitant therapy such as methotrexate. Drug or food interactions: Etanercept may increase infection risk or decrease blood cell counts when used with other immune modulators or immunosuppressant drugs (for example, anticancer agents or corticosteroids). Immunization with some vaccines may not be effective. Who should not use this medication: People who have moderate to severe heart failure should not take doses greater than 5 mg/kg (of body weight). Those with allergy to infliximab or mouse protein should not take the drug. Patients with active infection, including tuberculosis, should not use the drug. Use: Infliximab is given as a two-hour intravenous infusion in a doctor's office. Initially, three doses are given within a six-week period; thereafter, a single dose is given every eight weeks to maintain the drug's effect. The interval between doses is shortened if the eight-week regimen fails to control symptoms. It is most often used with concomitant methotrexate. Drug or food interactions: Use of other immunosuppressant drugs increases the risk for infection. Side effects: Infliximab may increase the risk of infection, particularly when other immunosuppressant drugs are used concurrently. People with heart failure may experience worsening of heart disease. Infliximab may exacerbate tuberculosis and drug-induced lupus. Symptoms could include fever, rash, headache, or muscle aches three to 12 days after infusion. The body may eventually produce antibodies toward infliximab, thereby decreasing the drug's effectiveness. Who should not use this medication: People with allergy to golimumab must not use it. Treatment must not be started if an active infection is present. Use: Golimumab (Simponi) is given as an injection every month. Simponi Aria is the intravenous formulation of golimumab and is given intravenously every four weeks initially, and then every eight weeks. It is most often used with concomitant methotrexate. Drug or food interactions: Clinical investigators are studying whether other immunosuppressant drugs increase the risk for infection if administered with golimumab. Side effects: Golimumab must be used with caution in people with a history of nervous system disorders or heart disease. Golimumab may cause exacerbation of tuberculosis and drug-induced lupus. Call a doctor if symptoms of lung or sinus infection (for example, fever, cough, sinus pressure, or headache) develop. Who should not use this medication: People with allergy to certolizumab must not use it. Treatment must not be started if an active infection is present. Use: Certolizumab is given as an injection every other week or monthly. It can be self-administered at home or administered in a doctor's office. Drug or food interactions: Clinical investigators are studying whether other immunosuppressant drugs increase the risk for infection if administered with certolizumab. Side effects: Certolizumab must be used with caution in people with a history of nervous system disorders or heart disease. Certolizumab may cause exacerbation of tuberculosis and drug-induced lupus. Call a doctor if symptoms of lung or sinus infection (for example, fever, cough, sinus pressure, or headache) develop. Who should not use this medication: People with allergy to adalimumab must not use it. Treatment must not be started if an active infection is present. Use: Adalimumab is given as an injection every other week (or sometimes weekly). It is most often used with concomitant methotrexate. Drug or food interactions: Clinical investigators are studying whether other immunosuppressant drugs increase the risk for infection if administered with adalimumab. Side effects: Adalimumab must be used with caution in people with a history of mouse protein allergy, nervous system disorders, or heart disease. Adalimumab may increase blood pressure or cause heart rhythm abnormalities. Adalimumab may cause exacerbation of tuberculosis and drug-induced lupus. Call a doctor if symptoms of lung or sinus infection (for example, fever, cough, sinus pressure or headache) develop. Who should not use this medication: Do not take tocilizumab if you are allergic to it or any of its ingredients. Use: Tocilizumab is given as a monthly intravenous infusion or subcutaneous weekly injection. Drug or food interactions: The risk of serious infections (for example, pneumonia) may increase if tocilizumab is taken with other biologic medications. Who should not use this medication: Do not take sarilumab if you are allergic to it or any of its ingredients. Use: Sarilumab is given as a monthly intravenous infusion or subcutaneous weekly injection. Drug or food interactions: The risk of serious infections (for example, pneumonia) may increase if sarilumab is taken with other biologic medications. Who should not use this medication: Those with allergy to rituximab should not take the drug. Patients with active infection, including tuberculosis, should not use the drug. Use: Rituximab is given as a four-hour intravenous infusion in a doctor's office twice two weeks apart every six months. Drug or food interactions: Use of other immunosuppressant drugs is possible but increases the risk for infection. Side effects: Rituximab may increase the risk of infection, particularly when other immunosuppressant drugs are used concurrently. Rituximab may exacerbate tuberculosis and drug-induced lupus. Symptoms could include fever, rash, headache, or muscle aches during or after infusion. This biologic medication is generally reserved for a specific type of rheumatoid disease in children called systemic onset juvenile inflammatory arthritis. Who should not use this medication: People with allergy to anakinra or Escherichia coli-derived proteins should not take anakinra. Treatment must not be started if an active infection is present. Use: Anakinra is taken as a daily injection at approximately the same time each day. Drug or food interactions: The risk of serious infections (for example, pneumonia) may increase if anakinra is taken with tumor necrosis factor antagonists such as etanercept (Enbrel), adalimumab (Humira), or infliximab (Remicade). Anakinra does not cause drug-induced lupus. First in a new class of drugs for rheumatoid arthritis, tofacitinib is a Janus kinase inhibitor (JAK inhibitor) that works by blocking chemical messengers responsible for inflammation in rheumatoid arthritis. It is given orally twice daily. Side effects include cancer, interference with normal immune response resulting in infections, perforation of the stomach, and blood test abnormalities. It is not known if tofacitinib is harmful during pregnancy, and it is not recommended during pregnancy or breastfeeding. Drugs in this class include betamethasone (Celestone Soluspan), cortisone (Cortone), dexamethasone (Decadron), methylprednisolone (Solu-Medrol, Depo-Medrol), prednisolone (Delta-Cortef), prednisone (Deltasone, Orasone), and triamcinolone (Aristocort). How corticosteroids work: These drugs decrease swelling and inflammation by suppressing immune response. Use: Corticosteroids can be taken in various ways (oral, injection, intravenous, intramuscular, intra-articular). The goal is to use the smallest dose that will control symptoms. The length of treatment should be as short as possible in order to decrease the risk of developing side effects. When taken orally, take with food to decrease stomach upset. Drug or food interactions: Many drug interactions are possible; therefore, consult with a doctor or pharmacist before taking new prescription or over-the-counter medications. Aspirin, NSAIDs, such as Advil or Aleve, or other drugs associated with stomach ulcers may increase the risk of developing stomach ulcers. Corticosteroids may decrease potassium levels and must be used with caution with other drugs that decrease potassium levels (for example, diuretics (Lasix]). Side effects: Ideally, corticosteroids are used for only a short time in order to bring sudden flares in symptoms under control. Long-term use is associated with serious side effects, such as osteoporosis, glaucoma, cataracts, mental changes, abnormal blood glucose, or arrested bone growth in children before puberty. After prolonged use, the corticosteroid dose must be gradually decreased over weeks to months to avoid corticosteroid withdrawal syndrome. Many studies are evaluating drugs to improve symptoms and to halt or reverse joint destruction of rheumatoid arthritis. Contact a rheumatology specialist for information on new drugs that may be available soon. Although rheumatoid arthritis can have many different symptoms, joints are always affected. Rheumatoid arthritis almost always affects the joints of the hands (such as the knuckle joints), wrists, elbows, knees, ankles, and/or feet. The larger joints, such as the shoulders, hips, and jaw, may be affected. The vertebrae of the neck are sometimes involved in people who have had the disease for many years. Usually at least two or three different joints are involved on both sides of the body, often in a symmetrical (mirror image) pattern. Klippel, J.H., et al. Primer on the Rheumatic Diseases. New York: Springer, 2008. Please share your experience with rheumatoid arthritis medications.